Just had to add a photo of the two dogs getting along. We were a bit worried, but things are OK, as long as Circe takes her signals from Indy, especially when he has a rawhide! For the Love of Literature! Click here: Maureen Wittmann: Awesome News! a puppy face...we now have a new puppy. 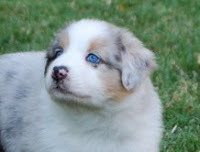 This is Circe, a 10 week old Australian shepherd puppy. She joins Indy, our 10 year old Aussie. She is driving him crazy with her antics. Overall, though, she is mighty good!